Both public and private investment keep the economy growing at a high pace in 2019, whereas export activity is further abating this year. Household consumption will continue to rise rapidly in 2019. While employment increases, skill shortage results in strong wage growth. The incoming coalition government may pursue a more lax fiscal policy. 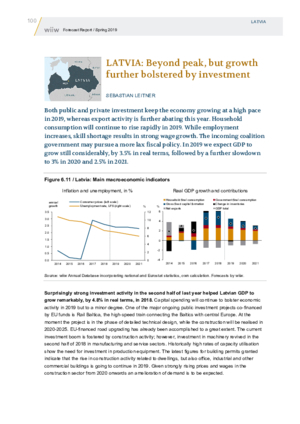 In 2019 we expect GDP to grow still considerably, by 3.5% in real terms, followed by a further slowdown to 3% in 2020 and 2.5% in 2021.